It is known that Leonard Bernstein, Stephen Sondheim and Jerome Robbins created in 1955 a fantastic musical about Puerta Ricans who settled on the extreme west side of New York. However, it is not popularly known that these three visited the Philippines (particularly San Juan), and put up a store to capitalize on this musical. 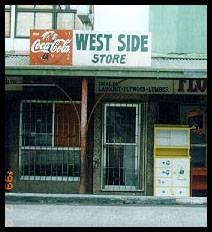 However, due to the ingenuity of the three, they decided to convert the store from a musical-items store to a sari-sari store. And since around 1960, the store has been raking in the profits. We hope. Disclaimer: What I have just mentioned in this write up are all blatant lies. Yes, folks, they are not true. Jerome, Leonard and Stephen have never sold musical-related items in the Philippines, let alone put up a store. This is for humor purposes only. And if my write-up was so realistic that you honestly believed it, then there's honestly something wrong with you.